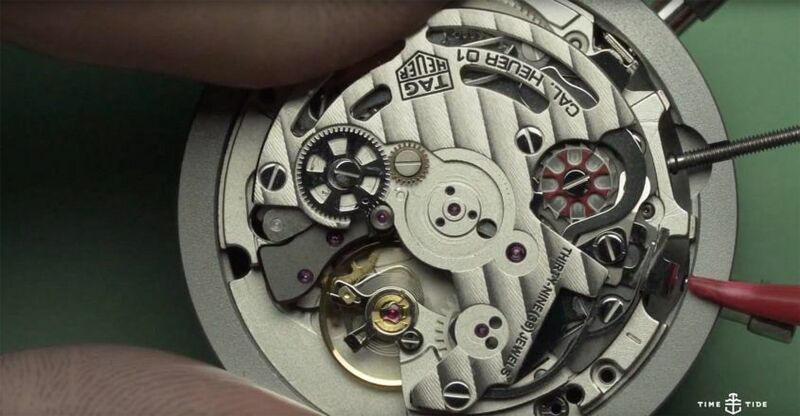 There is something inherently fascinating about seeing a watch movement emerge from its case. After however many years of seeing this great reveal, I never get over it. Regardless of the model, or the brand, I am somehow always struck by the same thing: its diminutive size, its delicacy, its complexity when separated from its exoskeleton. The very same thing happened when TAG Heuer master watchmaker Shalen Gokoolparsadh loosened the screws on the clear caseback of the Heuer 01 a few seconds into this disassembly video, revealing a tiny, circular micro-city of details to explore. And, over the course of this seven-minute video, Shalen picks out the key sights. On our trip we’ll journey past the rotor, explore the column wheel, disarm the chronograph — exposing the energetic oscillating pinion — and explore the mysteries of Incabloc. An action-packed itinerary if ever there was one. The base movement for the Heuer 01 is the Calibre 1887, which itself is based on a SII (Seiko Instruments Inc.) TC78 platform first developed and patented in 1997. Marc Walti, TAG Heuer’s head of products, explains that it “features the same dimensions and the same features, such as 50 hours power reserve, column wheel, oscillating pinion, chronograph functions. But the aesthetic of the movement has been completely reworked. But that’s enough from us. Over to Shalen.